As summer winds down into autumn, come learn what to do with those flower bunches you’ve been buying at the farmers markets, florists, and grocery stores (or picking from your own garden!) to make them look lovely. 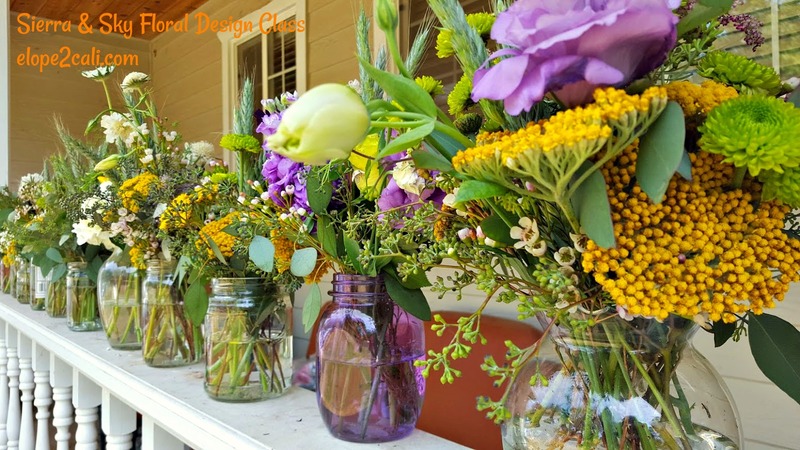 We’ll show you all the tips and tricks on how to keep flowers fresh in any type of container while creating a wonderful trendy design and skills that you can use to re-create your Summer Mason Jar design at home, and into other seasons. We provide the knowledge on how to recognize the freshest flowers, how to care for flowers to make them last longer, and basic design skills on how to create a beautiful flower arrangement. You will then create a bouquet to take home, using our tools and guided by our step-by-step instructions. No experience necessary. BYOF!!! Bring Your Own Flowers! Please bring a bunch of about 20 flower stems, or about 9-12″ across. Or, pay a $15 materials fee and we will bring your flowers for you. You will also need a mason jar. Monique Wilber of Sierra & Sky, has 30 years of experience in wedding floral design, and loves to teach others and bring out the best in their creative selves. With a teaching credential, she is patient and will provide you with creative confidence. 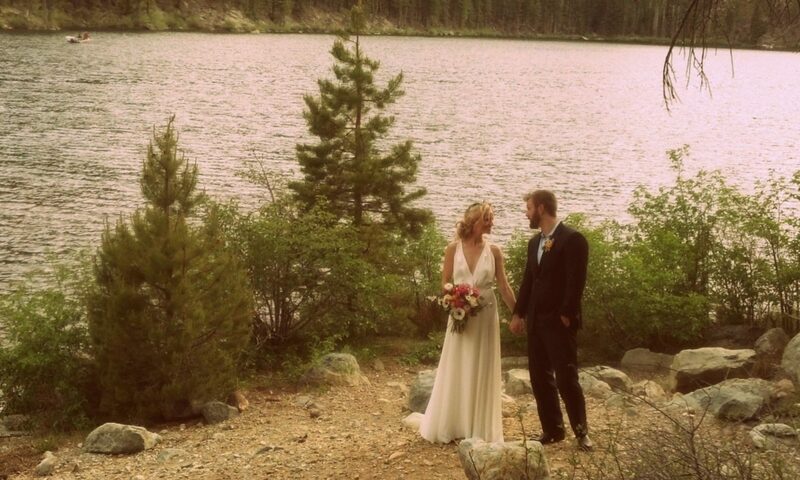 Jessa Wilber of Sierra & Sky has worked in wedding services for six years. She is a talented young designer and enjoys helping others to learn floral design. She has designed many weddings with Sierra & Sky. Bring your own mason jar, flowers or pay $15 at the time of registration for flowers. Register online or register by phone, below (Katie). Join us for a fun afternoon of floral design at Annabelle’s Chocolate Lounge in Diamond Springs, California, on Saturday, January 21, 2017, from 12:00 – 1:30 pm. Enjoy a no-host wine and brew bar, which also features tea and sodas, and handmade chocolate (to make you swoon), all available for purchase! You’ll make a floral art masterpiece, and will take it home to enjoy. 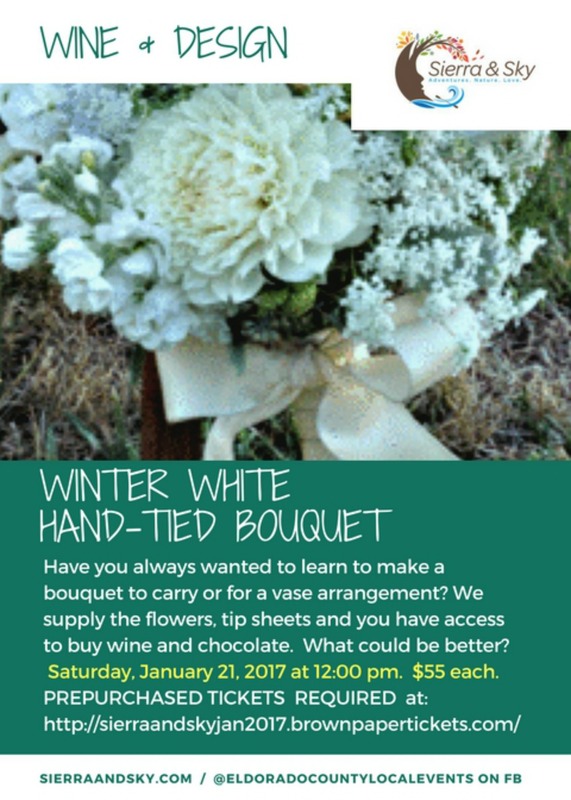 Our January 21st class features a hand-tied Winter Whites and Green Floral Bouquet. You’ll create a hand-tied arrangement using greens and seasonal flowers, all with a contemporary botanic style. This style of arrangement can be put into a vase, or made into a wedding bouquet, depending on how you finish off the stems. We provide flowers, vases, supplies, and tip sheets (so you can go home and make this again!). You and your friends and family enjoy a fun time and learn a new art. Please arrive a minimum of 20 minutes early to check in, purchase some yummies, and find your seat. Seating is limited. Minimum age for class is 15. This class is great for beginners and intermediate students! Your host, Monique Wilber, owner of Sierra & Sky, has 28 years of experience in wedding floral design. Please note, prices for classes from month to month will vary due to supplies used and season. Photo shown is for inspiration only as to the type of design we will be creating. 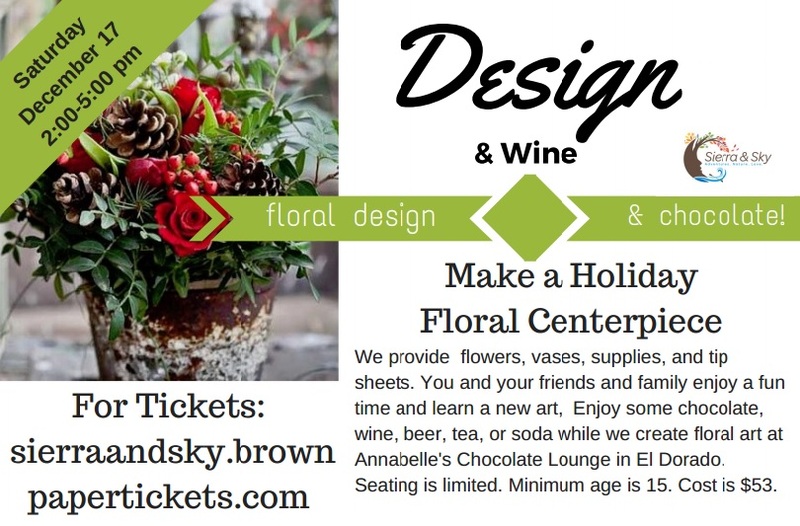 DIY Floral Design Class El Dorado, CA near Sacramento Holiday Design! You asked…so our popular DIY Floral Design classes are back! Our new venue is Annabelle’s Chocolate Lounge in the charming El Dorado County town of…El Dorado (note: this is not El Dorado Hills – this town is near Placerville, Diamond Springs, and Shingle Springs). The address is Annabelle’s Chocolate Lounge, 6240 Pleasant Valley Rd, El Dorado, CA 95623. That’s right! Not only do you get to learn a new art skill – floral design – and take home your beautiful creation, but you also have access to a no-host (that means you purchase) in-house-made chocolates, wine bar, beer, and soda and tea all available. What fun! Good times, bring a family member or a friend, or just enjoy the good company of others. Our December 17th class features a Holiday Centerpiece. You’ll create a low centerpiece using classic winter greens, your choice of accent colors (red, blue, or white) for flowers and baubles, all with a contemporary style. This is basic designing, and you can use this skill to make your own centerpieces. Seating is limited. Minimum age for class is 15. This class is great for beginners! So, join us on December 17, 2016, from 2-5 pm. You must buy tickets in advance so that I can purchase your flowers and supplies for you and bring them. Get tickets here: http://sierraandsky.brownpapertickets.com/. See our class reviews on Yelp. Next date for another class: Saturday, January 14, 2017. For more information on the calendar at http://sierraandsky.com/ or buy tickets for this hand-tied bouquet (great for brides or for a vase arrangement!) here: http://sierraandskyjan2017.brownpapertickets.com/. February will feature an Ikebana/Asian-inspired design; March will bring on Wedding Bootcamp (separate classes for hand-tied bouquet; corsages & bouts; and centerpieces).